There seems to be a prevalent myth that, when it comes to GMOs, Monsanto, and related topics, there is an “information gap,” that is, that these issues simply haven’t been studied enough, or that they haven’t been studied in any truly comprehensive or long-term manner. The Internet has become a sort of “Wild West” when it comes to information: Anyone can publish anything they like. Sensational headlines trend. Dense scientific papers don’t. Conflicts of interest can be hard to identify. Charlatans, snake oil peddlers, quacks, and people who don’t realize that anecdotes don’t qualify as evidence, have free reign to produce articles that prey upon some of your deepest fears and appeal to the less-than-logical elements of the human brain, leading you to make potentially fatal decisions. When it comes to GMOs, misinformation runs deep. A quick Google search yields results that make claims implicating GMOs in everything from autism to cancer to the neocolonial exploitation of the global south by Shinra-esque biotechnology corporations. These articles appeal to your emotions and strike a chord with your innate biological desire for survival. We want what’s best for our health and the health of our loved ones. We want to be responsible citizens of Planet Earth and take care of the environment. We want to make the right choices. Planting a seed of doubt in someone’s mind is among the easiest things to do. Emotionally-driven decision making, however, can have very adverse consequences. That is why it is imperative that we make our decisions based on reliable sources and methodologically-sound, peer-reviewed data with results that can be replicated across space and time. 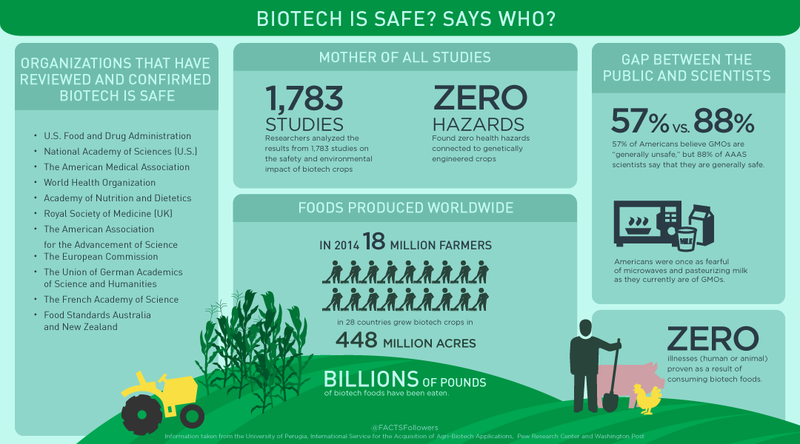 Let me be clear: There is no shortage of information on the safety and environmental sustainability of GMOs. (Don’t take my word for it – keep reading and you’ll see what I mean.) While some “anti-GMO activists” may continue to assert otherwise, the facts are not on their side. The reality of the situation is that extensive research has been done and countless major, international bodies of science and medicine have reviewed that data in coming to the consensus conclusion that GMOs are as safe as, or safer than, “conventional” and “organic” foods. In this catalog, I will be documenting both scientific research and articles from reliable sources that tackle some of the many myths surrounding GMOs, as well as Monsanto. If you would like to recommend additions to this catalog, or if you have any questions regarding the information contained herein, you are more than welcome to contact me. 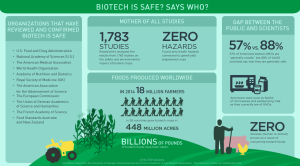 Is there a scientific consensus regarding the safety of GMOs? Labeling GMOs: What’s the harm? But, didn’t the World Health Organization declare glyphosate to be carcinogenic? Have GMOs helped to create herbicide-resistant superweeds? Do genetically engineered crops really increase pesticide use? Is organic necessarily healthier or better for the environment? Does Monsanto aggressively attack small farmers? Is Monsanto going on trial for crimes against humanity? Are farmers forced to buy GM seeds? Does a patent allow a private company to own the seeds they create? Did GMOs cause farmers in India to commit suicide? Why do people oppose GMOs? What’s the harm in opposing GMOs? Click on the image for a larger version. To learn more, click here. The war against genetically modified organisms is full of fearmongering, errors, and fraud. As Dr. Novella summarizes, “We now have a large set of data, both experimental and observational, showing that genetically modified feed is safe and nutritionally equivalent to non-GMO feed. There does not appear to be any health risk to the animals, and it is even less likely that there could be any health effect on humans who eat those animals. In order to maintain the position that GMOs are not adequately tested, or that they are harmful or risky, you have to either highly selectively cherry pick a few outliers of low scientific quality, or you have to simply deny the science.” Here is a comprehensive list of animal feeding studies. I also recommend “A decade of EU-funded GMO research” (published by the European Commission), which evaluates both food safety and environmental impacts. Another database of relevant studies is maintained here. If you browse some of the “alternative” health blogs that are infamous for their anti-GMO rhetoric, you may see references to outliers (in other words, a small handful of poorly-conducted studies whose results contradict all of the other data on the subject), discredited or retracted articles, logical fallacies, conspiratorial ideation, and other such “arguments.” One of the best articles that breaks down these responses is “The Bad Science Checklist of GMO Opponents.” It is not uncommon to see individuals “cherry picking” extraneous material and attempting to construct a field of validity via logical fallacies. Finding a single study that says “GMOs are dangerous” doesn’t discredit the overwhelming consensus that GMOs are safe. It’s far more likely that the outlying study suffered from poor methodology, fell through cracks in the peer review process, etc. Confirmation bias “is a cognitive bias that causes us to search out evidence that supports our point of view, while ignoring anything that doesn’t. It is a basic human behavior.” If we are truly interested in the truth, we must not allow ourselves to fall victim to it. Anti-GMO “activists” are pushing for mandatory GMO-labeling requirements. Even some individuals who don’t take issue with GMOs are asking, “Well, what’s the harm? Why not just label them?” Slapping a label on foods containing GMOs may sound like an innocuous proposition – but that couldn’t be further from the truth — for several reasons. The ultimate irony is that opponents of GMOs are often concerned about corporate influence and special interest groups – the very things that fuel the “non-GMO” movement and efforts to have GMOs labeled. Take a look at “The Roots Of The Anti-Genetic Engineering Movement? Follow The Money!” by Henry I. Miller (quoted below). There exists in this country a vast, well-established, highly professional, protest industry fueled by special interest groups seeking to line their own pockets while harming the public interest. How vast? A review of tax returns of the “non-profit” activist organizations opposing agricultural biotechnology and other modern production methods reveals more than $2.5 billion is being spent annually in the United States by these professional advocacy groups to shape our beliefs and influence our purchasing habits. Like Prop. 37 in California, the majority of this money comes not from “grassroots” donations, but from big-money special interests that benefit from these foods scares. The leading corporate contributors and the biggest donors behind the Prop. 37 campaign in California are organic food, natural product and alternative (read: quack) health product companies. These “fear profiteers” prosper from scare campaigns about food and how it’s produced. Their support enables activists to foment bogus health and safety fears about the agricultural products and production techniques used to grow conventionally produced (i.e., non-organic) foods, thereby helping to drive customers to higher-priced organic offerings. Boosting costs through labeling initiatives and other tactics allows the less efficient organic alternatives to become more cost-competitive. Misled, bamboozled consumers are the losers. If you don’t want your food genetically modified, tell nature to stop it. Oh, no! GMOs are going to make everyone autistic! Glyphosatan: Will one in two children will be autistic by 2025 due to use of glyphosate on food crops? GMOs cause leukemia!? Think again. I want to place special emphasis on this one. I have seen this claim used in countless debates: “The World Health Organization lists glyphosate as carcinogenic to humans.” Not exactly. This is another example of scientific information being taken out-of-context and transformed into a sensational headline. The International Agency for Research on Cancer (an arm of the World Health Organization) evaluates hazards — not risks — (there’s a huge difference) of all sorts of common products and activities. 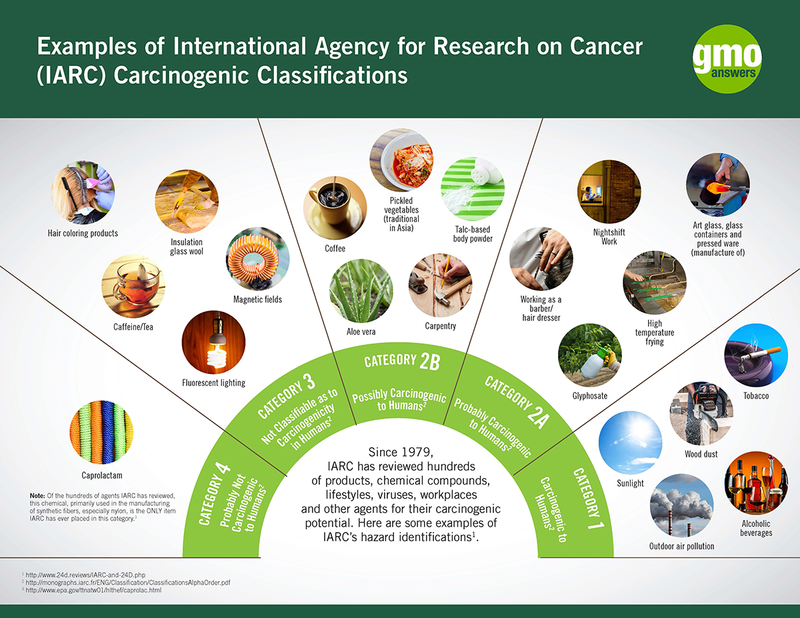 IARC listed glyphosate as a “Class 2A Hazard” indicating that it is “probably carcinogenic” to humans. I understand how that can be disconcerting. The most important thing to remember is that the dose makes the poison. Paracelsus, a 16th century Swiss German physician, said, “All things are poisons, for there is nothing without poisonous qualities. It is only the dose which makes a thing poison” – and he was right. That’s why people who spray herbicides and pesticides onto plants wear protective equipment but those same chemicals do not affect consumers who eat the food that was once sprayed. You can read more about the IARC’s classification of glyphosate – and why it can be misleading when taken out of context – here. Epidemiologic studies of glyphosate and cancer: a review. Are lower pesticide residues a good reason to buy organic? Probably not. Local and organic food has extra safety risks. Just ask Chipotle. For some reason, many anti-GMO arguments center on the conduct of Monsanto and there is this misconception that GMOs = Monsanto and Monsanto = GMOs. The information I’ve shared above cannot be refuted by references to corporate practices of Monsanto that you may find to be unsavory. However, I have decided that I will dedicate space in this catalog to debunking many of the myths surrounding Monsanto to help shut down bogus arguments put forth by those who make the fallacious equivalence I mentioned earlier. Does a “patent” allow a private company to own the seeds created? Anti-Biotech Opposition to Golden Rice Has Cost 1.4 Million ‘Life Years’ in India Alone. There are also the obvious dangers of rejecting evidence, rejecting logic and rational thinking, abstaining from critical thought, and buying into baseless claims despite overwhelming evidence to the contrary. These mindsets lead to everything from the rejection of beneficial technologies to death from preventable causes. Golden Rice: The GMO could save millions of lives. Is there a connection between Monsanto and the Zika virus outbreak? No. In February 2016, rumors began circulating that microcephaly is being caused by the use of pyriproxyfen, a larvicide — and numerous less-than-reputable sources quickly indicted Monsanto. What these sources failed to realize, however, is that Monsanto does not produce larvicides. Pyriproxyfen is produced by Tokyo-based Sumitomo Chemical (which is not owned by Monsanto Company). As for the rumor itself – that is, that microcephaly is being caused by pyriproxyfen, rather than the Zika virus (or some other cause), is wholly unsubstantiated. Scientists, doctors, and public health professionals are working diligently to reach evidence-based conclusions. There is nothing to be gained from creating and circulating rumors that are predicated upon a lack of evidence (including no laboratory tests or epidemiological studies), fear mongering around an information gap, and the overall misrepresentation of a situation by a small group of heavily biased individuals. This is a serious situation and we owe it to affected and at-risk individuals to disseminate information responsibly. A Viral Story Links The Zika Crisis To Monsanto. Don’t Believe It. No, GM Mosquitoes Didn’t Start The Zika Outbreak. February 19th 2016: Added information regarding Monsanto and the Zika Virus. Michael, thanks for linking to one of my blog posts in this really extensive list of links! And kudos on working in a FFVII reference! I would like to add a comment and a reference to the section “Do genetically engineered crops really increase pesticide use?”. I hope that it could be of interest to your readers. When one considers the impact of GMOs on pesticide use, one must differentiate between insect-resistant crops and herbicide-tolerant (HT) crops. Indeed Bt crops usually can reduce insecticide use provided that insects other than the targeted ones don’t attack the Bt crops after a certain time period. However, for GM herbicide-tolerant crops, where generally glyphosate has replaced the previously used weedkillers, when one looks at the impact of GM herbicide-tolerant crops on herbicide use, one must do it NOT for one or two years, but for a much LONGER PERIOD of time. Indeed, during their very first years of adoption, HT crops often led to some decrease in herbicide use. However, the repetition of glyphosate-tolerant crops and of glyphosate only applications in the same fields without sufficient alternation and herbicide diversity has contributed to the appearance of glyphosate-resistant weeds. These weeds have resulted in a rise in the use of glyphosate and other herbicides. A 2016 article exploring this situation and the impacts of herbicide-resistant weeds has just been published in Environmental Management, a scientific peer-reviewed journal. The paper looks into GM herbicide-tolerant crops and their effects on herbicide use, particularly glyphosate. It then analyzes the spread of glyphosate-resistant weeds worldwide and their consequences, particularly for HT soybean in the USA. This article is the result of a research work carried out by a scientist working in public research with no conflict of interest. Thank you for this extensive anti-woo list. Already book marked. This is fantastic information all catalogued for my obsessive little heart. Thank you for sharing. It is on my FB wall.